A woman was detained in a hospital ward under the Mental Health Act when she should have been receiving care for her severe autism, her family has claimed. Eilidh MacNeil, 23, from Stornoway, in Lewis, was made the subject of a 28-day detention last Wednesday. The order was lifted this week. The local Health and Social Care Partnership said it was unable to comment on individual cases. But it said it was committed to supporting people with complex needs. The partnership is in the process of moving Eilidh into a facility on the mainland. 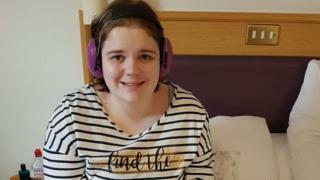 Her family, who would prefer to see Eilidh looked after closer to home or at a charity-run specialist care campus, said they had received an apology from the partnership for the detention. Eilidh was detained after her wellbeing deteriorated following an incident at accommodation where she was living. Her family said she had been placed in this accommodation by the local Health and Social Work Partnership against the advice of staff at residential school where she received care for 12 years. In the incident, a male resident gained access to her room, causing her distress. He was removed and placed in other accommodation, while Eilidh was detained in an empty ward at Western Isles Hospital in Stornoway. Speaking on behalf of Eilidh and her family, her aunt Catherine Anne Macleod said medical staff had interpreted Eilidh’s autism as a psychotic episode. The order was lifted after it was challenged by her family. Eilidh’s family have raised several complaints with the Care Inspectorate and are calling for an investigation into her care. Catherine said her niece’s health would only deteriorate further under the proposals to move Eilidh to accomodaton on the mainland.. The Health and Social Care Partnership, which involves local authority Comhairle nan Eilean Siar and NHS Western Isles, said “as a general principle” it was committed to supporting people with complex needs in their own communities. However, it added: “For a small number of people there are circumstances in which outcomes will improve if they are supported in specialist centres of excellence on the mainland. “This is not a matter of a lack of financial resources but rather not having the required levels of specialist care and expertise. “Whilst this is the case for many areas across Scotland it is clearly more acute in an island setting because it involves those requiring such care to live away from home for perhaps extended periods of time. A spokesman for the partnership said it was in the process of developing a new strategy on learning disabilities and autism. He said: “This will consider whether we have the right balance between local support and specialist mainland provision. Local SNP MP Angus MacNeil and MSP Alasdair Allan have been offering support to Eilidh’s family. Mr Allan said they had reason to be anxious about whether long-term accommodation could be provided for Eilidh on the island. “I hope that we will now see different agencies working together in the islands to find a solution,” he said.